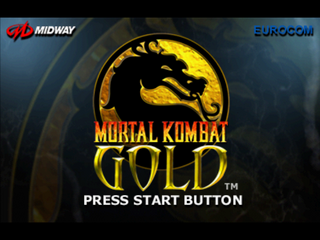 Mortal Kombat Gold is a Sega Dreamcast exclusive update to Mortal Kombat 4, released in 1999. The game was a Dreamcast launch title in North America and Europe. Gold is essentially the same as Mortal Kombat 4, but adds Kitana, Mileena, Cyrax, Kung Lao, Baraka and Sektor from previous Mortal Kombat games. It also includes three new stages: The Living Forest, The Church, and The Soul Chamber. It also has a new weapon select system. The player gets a low and high punch, low and high kick, and a block and run button. New to the series is a sidestep move which can be used to avoid projectiles. Also new to the series is a bonebreaker move which can be used up close and is activated by pressing Low Kick. There are interactive objects in some stages such as throwing stones. Combinations of buttons can be used to perform special moves. Each character is given a weapon which can be wielded with a button combination. If the weapon is dropped it can be used by the other player. By using more button combinations at the end of the round the player can use any of two finishing moves and in certain stages a stage fatality. The game was criticised upon release for its sub-par graphics. Rather than play to the Dreamcast's strengths, the game was said to look more like the Nintendo 64 port of Mortal Kombat 4. Like several of Midway's Dreamcast games, the game was re-released with a "Hot! New!" label in North America, fixing many of the game's bugs (including VMU support, allowing the player to save). As well as the label the game can be identified with its red-tinted disc. Another character named Belokk was shown in early screenshots from Game Informer but was cut from the final game. According to Ed Boon, Belokk was cut due to time constraints. Main article: Mortal Kombat Gold/Magazine articles.